Happy Monday, everyone! I'm sure you're all a tad disappointed that the weekend is over (I know I am! ), so I have something to help ease the hurt a little - a Luview giveaway! 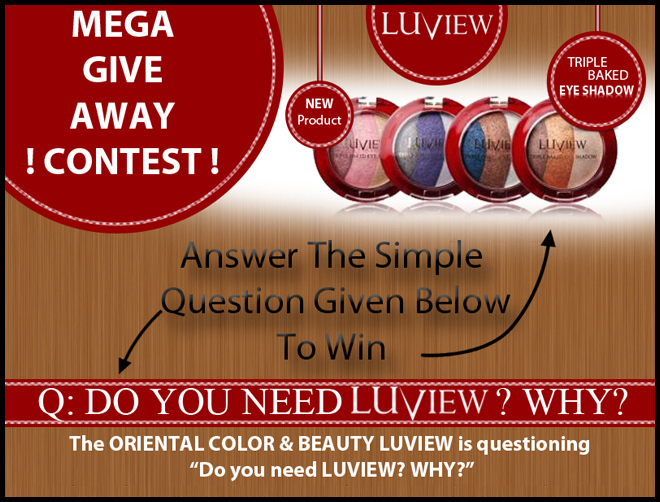 I am giving away two full sets of Luview's latest release - the Luview Triple Baked Eyeshadows! These are highly pigmented, beautifully created eyeshadows with fantastic texture. I was sent a set to try out and I must say, these are absolutely lovely! They come in a variety of colours that suit almost all skin tones and, again, the colour payoff is absolutely fantastic! This giveaway is open worldwide! The two winners will receive one set each of 4 Luview Triple Baked eyeshadow palettes (the entire collection). It will run until 12AM AEST on the the 30th of June, 2012. 'Like' the Luview Global Facebook page, and leave a comment starting with "I need Luview because...", and leave your nationality at the end of the comment. Tweet the following: "I just entered @EmilyQuak's Mega Luview Giveaway! Check it out here: http://bit.ly/Lz8apw"
Fill in the form below. Remember to include your email address so I can contact you once I draw the winners! The winners will be drawn at random, and I will announce them on this blog. I will also be contacting them via email. If the winners fail to respond to the email within 24 hours, they forfeit their prize, and I will draw new winners.